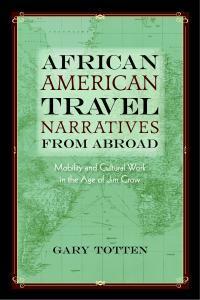 In this book, Gary Totten examines the global travel narratives of a diverse set of African American writers, including Ida B. Wells, Booker T. Washington, Matthew Henson, Jessie Redmon Fauset, and Zora Neale Hurston. While these writers deal with issues of identity in relation to a reimagined sense of self—in a way that we might expect to find in travel narratives—they also push against the constraints and conventions of the genre, reconsidering discourses of tourism, ethnography, and exploration. This book not only offers new insights about African American writers and mobility, it also charts the ideological distinctions and divergent agendas within this group of writers. Totten demonstrates how these travelers and their writings challenged dominant ideologies about African American experience, expression, and identity in a period of escalating racial violence. By setting these texts in their historical context and within the genre of travel writing, Totten presents a nuanced understanding of both popular and recovered work of the period.